Are you tired of unsightly weeds creeping into your lawn? Ortho® Weed B Gon® Chickweed, Clover & Oxalis Killer for Lawns Concentrate is formulated to kill tough weeds in your lawn. The formula kills Ground Ivy (Creeping Charlie), Speedwell (Veronica), Wild Violet and other tough lawn weeds as listed. The concentrate may be applied with the Ortho® Dial 'N Spray® Hose-End Sprayer or any other tank sprayer. 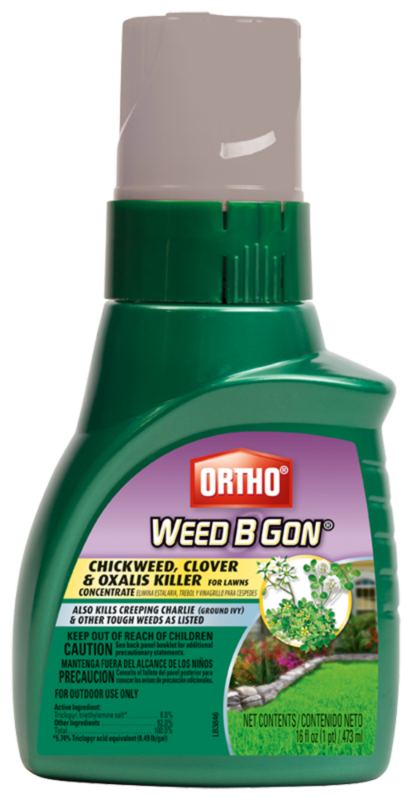 Trust Ortho® Weed B Gon® to kill weeds, not your lawn. 16 fluid oz treats 3,200 sq. ft.
May be applied with an Ortho Dial 'N Spray Hose-End Sprayer or any other tank sprayer. Measure area to be treated. Spray evenly over measured area. Use tank sprayer to spot treat. Spray individual weeds in the lawn thoroughly. Not for use on Bahia, Bermuda, Centipede, Kikuyu or St. Augustine lawns. Not for use on or around fruits, vegetables, or flowers. Rainproof 6 hours after application. Spray when temperature is below 90 degrees. Spray when air is calm to avoid drift to desirable plants. Apply when weeds are actively growing as needed throughout the season. Kills Chickweed, Dandelion, Oxalis, White Clover, Pennywort (Dollarweed), Black Medic, Plantains, Wild Geranium, Florida Pusley, Evening Primrose, Red Sorrel and Ironweed.